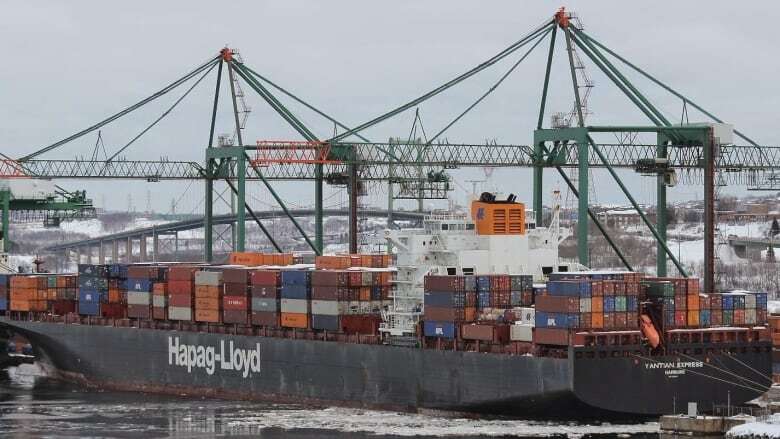 A firefighting tugboat was dispatched late Friday to help extinguish a fire burning aboard a large container ship about 1,200 kilometres off Canada's East Coast. A firefighting tugboat was dispatched late Friday to help extinguish a fire burning aboard a container ship about 1,200 kilometres off Canada's East Coast. When the wind picked up to more than 20 kilometres per hour, the crew suspended fighting the blaze and retreated to safety, said company spokesperson Tim Seifert. "We're focused on the security of the crew," Seifert said in an interview from Hamburg, Germany, where the company is based. "We've had quite a hefty weather change ... That's the reason why we had to suspend the firefighting procedures." Seifert confirmed no one from the ship's crew was injured, but he could not comment on the extent of damage. Seifert said the master of the ship was steering the vessel in the same direction as the wind, a manoeuvre intended to keep the flames from spreading to the rear of the ship, where the crew's quarters are located. A spokesperson for the U.S. Coast Guard in Portsmouth, Va., said coast guard officials in Boston received a call for help early Friday. At the time, the ship was 1,800 kilometres southeast of Cape Cod, Mass. Chief Petty Officer 3rd Class Joshua Canup said he couldn't comment on the extent of damage to the vessel or the well-being of the crew. "The coast guard continues to monitor the situation and a Good Samaritan vessel is on scene at this time," he said. According to a coast guard press release, the MV Happy Ranger was about 32 kilometres from the Yantian Express when help was requested.